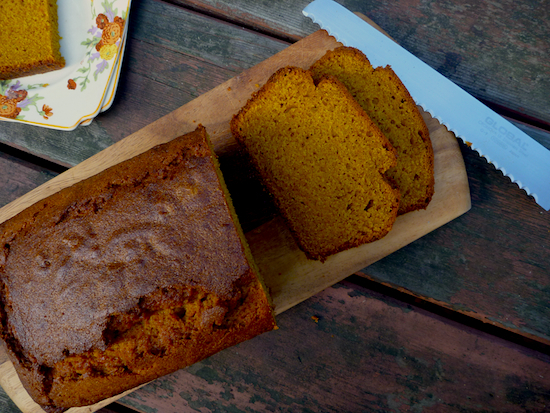 Could pumpkin bread be the new banana bread? It seems to be replacing banana bread on the breakfast menus of Sydney’s best cafes. The first time I tried pumpkin bread was at my favorite Sydney cafe, West Juliett in Marrickville. I shared a slice with a friend as we on the way to the airport, I would never have ordered it if we weren’t pressed for time. Pumpkin bread, banana bread, are just cake to me and aren’t usually high on the list of my breakfast priorities. One taste though and I was a bit like toad from Wind in the Willows after he discovers a new fad. I got a glazed, fanatical look in my eye and a pumpkin bread obsession was born. When I got back home I was determined to track down a recipe and recreate my own pumpkin bread. After an extensive search online and through my cookbooks, I finally got this recipe from Mike McEnearney’s book Kitchen by Mike, where it goes by the name Spicy Pumpkin Tea Cake. I dialed back the sugar ever so slightly, nixed the chopped glace ginger in syrup and replaced plain flour with spelt flour (making it much more nutritionally dense). I feel perfectly justified in renaming it a bread and magically turning it into much more sensible breakfast choice than something called tea cake. 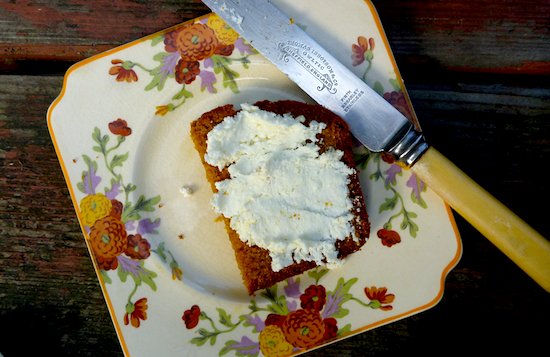 Served with fresh ricotta (as they do at West Juliett) and it becomes even more of special breakfast treat. I’ve been experimenting a bit with spelt flour lately. I’ve been replacing half or a third of the plain flour in cakes and biscuits with wholemeal spelt, which has a much milder and sweeter taste than ordinary wholemeal flour. Recently I discovered refined spelt flour. Spelt wheat has a lower yield than ordinary wheat but it has a much thicker husk, making it much more resistant to pests (one of the reasons most spelt is organically grown). Most of the nutrients are under the husk, which means, refined spelt has pretty much the same nutritional profile as wholemeal spelt flour. While I love the nutty flavor of the wholemeal spelt in this pumpkin bread I prefer the lighter taste of the refined spelt. I’m a pretty evangelical convert to pumpkin bread, it’s one of those things that you forget how good it is until you taste it again and you get another toad of toad hall, gobsmacked moment with that glazed obsessive look as you contemplate whether you can possibly eat another slice. 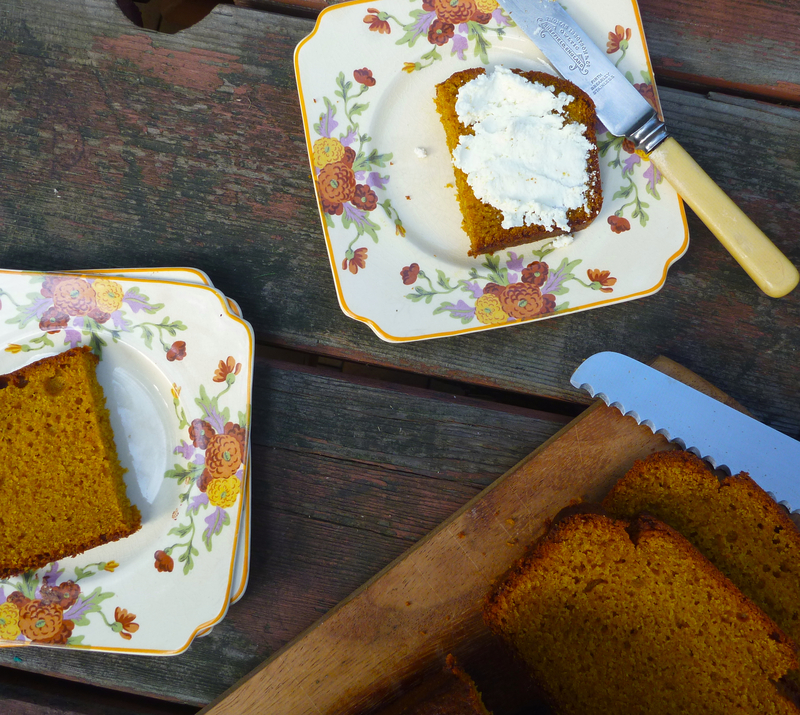 Some forethought is required to make this pumpkin bread. The pumpkin puree is made from pumpkin that is baked and left in a sieve to drain off overnight, making a drier more intense pumpkin puree. This is a hassle but I’ve taken to baking a double batch of pumpkin, draining it overnight then pureeing and freezing it 275 gram batches so I only have to defrost the puree to make a loaf of pumpkin bread . Apart from the whole baking and draining of the pumpkin it is an incredibly easy cake batter to bring together. Serve it for breakfast as a bread, then rename it as tea cake for morning and afternoon tea. Mike McEnearney suggests dressing it up with some creme fraiche and summer berries and you could call it desert. Spicy pumpkin spelt and olive oil bread, make it soon, you’ll be converted, obsessed even, forget the banana bread, pumpkin bread is the new, gobsmacking good, breakfast cake. The day before you make the cake preheat oven to 220C. Cut pumpkin into thick wedges, leave skin and seeds on and place skin down on a baking tray. Spray or lightly brush pumpkin flesh with oil and bake pumpkin for about 30-45 minutes until pumpkin is very soft and caramelised. Allow pumpkin to cool, scrape off seeds and skin and place in a fine sieve over a bowl. Don’t press pumpkin down but allow to drain overnight in fridge. The next morning there will a pool of orange liquid in the bowl, drain off and mash pumpkin to a smooth puree. I usually bake extra pumpkin so I get a couple of 275 gram lots of pureed pumpkin to place in the freezer for another pumpkin loaf but you can reserve left over puree to use as a side or to put in risottos, soups or pumpkin scones. Sift flour, baking powder, bicarbonate of soda and spices into a bowl. In another large bowl of an electric mixer place pumpkin puree, oil, caster sugar, salt and Glace ginger (if using). Mix until smooth then add eggs one at time and beat until smooth. Fold in flour mixture and mix until smooth. This will be a thick but still runny batter. Pour batter into loaf pan, smooth top and bake in oven for 45 – 60 minutes. Test with a skewer to see if it comes out clean. Leave to cool in tin for 20 minutes before cooling completely on a wire rack. If you are serving as a tea cake dust with icing sugar before serving. This sounds delicious. Pumpkin goes so well with these warm spices. You’ve inspired me to try spelt flour too – good to know that refined spelt flour is still a relatively healthy choice. Spelt’s beautiful to bake with and it’s higher in protein and nutrients than ordinary wheat flour. Looks delicious Elizabeth. And I love that square plate. I love you for this!!! I lived in Marrickville for 2 years and somehow never made it to West Juliette. I just spent the weekend in Sydney visiting my in laws and just this morning took my son to west Juliette (staying with my BIL in Newtown) and ordered him the pumpkin bread. He DEVOURED it! We got home to Hobart and I started googling pumpkin loaf recipes to find something I could play with and try to replicate WJ. You’ve done it for me! Going to make this, this week. Can’t wait to surprise my little boy with this “punkin cake bread”. I’m glad you finally got to West Juliette it’s still one of my favorite cafes in Sydney.